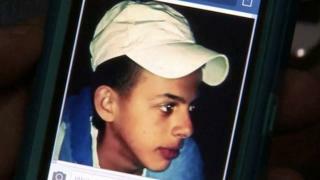 The 16-year-old Palestinian was beaten and burned to death in Jerusalem on 2 July in an apparent revenge attack. It came two days after the bodies were found of three Israeli teens who were abducted in the West Bank on 12 June. The Israeli authorities have named two men they say are Hamas operatives as suspects in the murders of Naftali Frenkel, Gilad Shaar and Eyal Yifrach, but the Palestinian Islamist group has denied responsibility. Increased tensions in the wake of the teenagers' deaths and the arrests of hundreds of Hamas members in the West Bank led to a surge of violence in the region, with militants in Gaza firing volleys of rockets into Israel and Gaza being hit by waves of Israeli air strikes. Mohammad Abu Khdair was seen being forced into a car in the Shufat district of occupied East Jerusalem in the early hours of 2 July. His charred body was later found in a forest on the edge of West Jerusalem. Palestinian Attorney General Mohammed al-Awewy said initial autopsy results showed soot in the teenager's lungs, indicating that he had been burned alive. Israel's Attorney General Yehuda Weinstein described the murder as "a grave and shocking act, perpetrated against a background of racism, against an innocent teenager". The Israeli ministry of defence meanwhile said it now recognised the killing as a "terrorist act" and had decided to recognise Mohammad Abu Khdair as a "victim of terrorism". "The decision was made as a result of the indictment... and the findings from the investigation which point to the nationalistic motive of his murder," a statement said. Two of the defendants were also charged with the attempted kidnapping of a seven-year-old Palestinian boy, as well as attempts to set several cars alight, Israeli media report. Little information about them has been published because of a court order. But they have been linked to right-wing extremist youth groups.